The recent news that Russia is collaborating with the European Space Agency to build a permanent settlement on the moon by the 2030s caused me to re-visit one of my favorite science-fiction television series (and Mattel’s tie-in toys), Space: 1999. The show, starring Martin Landau and Barbara Bain, originally ran in the UK for two seasons from 1975-1977. It depicted the space-faring adventures of the inhabitants of Moon Base Alpha, after a nuclear explosion knocks the moon out of earth’s orbit and into space. Through syndication, home video releases, and talk of a Space: 2099 reboot, Space: 1999 has achieved cult-favorite status and enjoys a dedicated fan base on both sides of the pond. 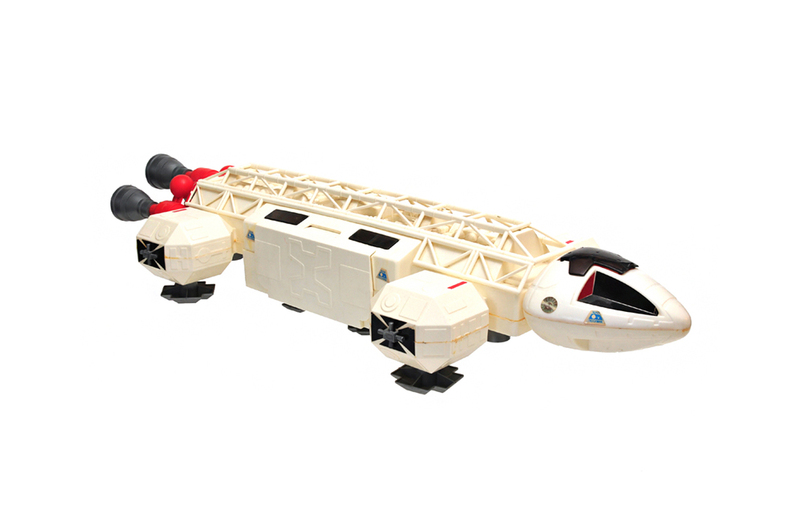 Mattel developed a line of Space: 1999 toys to tie into the TV series, including the Eagle 1 Spaceship. Released in 1976, the Eagle 1 is massive by toy standards (a fact that was played up in advertising): it checked in at over 2.5-feet long and a foot wide. The Eagle 1 is made mostly of molded plastic and has a number of parts and accessories that made it incredibly fun to play with as a child. The engines and nose cone are detachable, allowing players to create a mini spaceship. Each side of the toy’s main body opens to provide access to an operating “space crane”, weapons rack, chairs, and computer panels. Mattel also provided three figures with the toy representing characters from the show: Commander Koenig (Landau), Dr. Russell (Bain), and Professor Bergman (Barry Morse). The figures were minimally articulated and outfitted in orange spacesuits reminiscent of the show. The Eagle 1 had a short two-year shelf life and remains a sought-after collectible from the show. Matchbox Cars. My Little Pony. Transformers. These are three of the 12 finalists for the 2017 National Toy Hall of Fame at The Strong Museum in Rochester, NY.